I went to an auction preview at Stair Galleries in Hudson NY this past weekend for the sale they have coming up June 21st and 22nd. They had fun seating options that marry decoration with the practical. I love the way chairs can some times be just a decorative object, and not really something you'd want to sit on. This is one of a pair of whimsical carved side chairs (Lot 516) at the Stair auction. Not something I'd want to sit in, but a conversation piece! These have an auction estimate of $600 - $800. This is a room designed by Lorenzo Castillo in Madrid. The fabulous decorative chair on the right has an interesting shape, and decoration. Not sure how great it would be to sit in for any period of time! The daybed is always a wonderful choice for added interest - and seating! 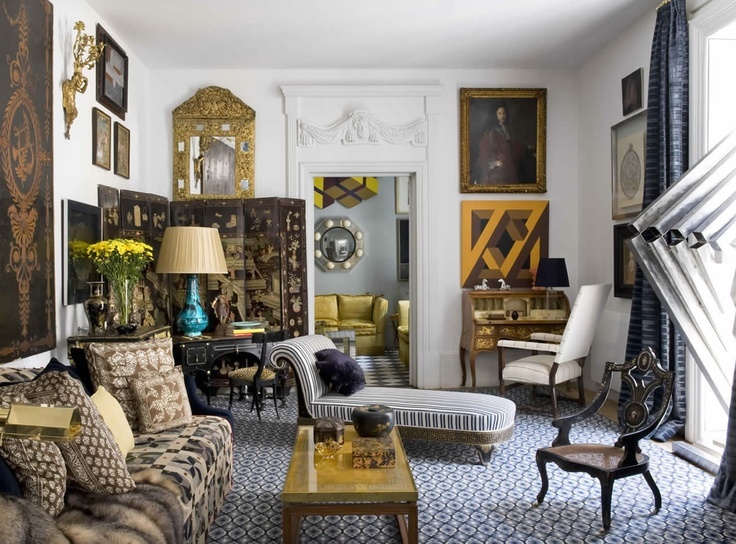 The designer Rose Uniacke uses a wonderful mix of high and low. The chair is a simple metal garden chair dressed up with a cushion. probably not used very much. The daybed in this Ojai, California house (via MarthaStewart.com) is smart looking and a place to lounge by the fire. It creates a focal point in the room. 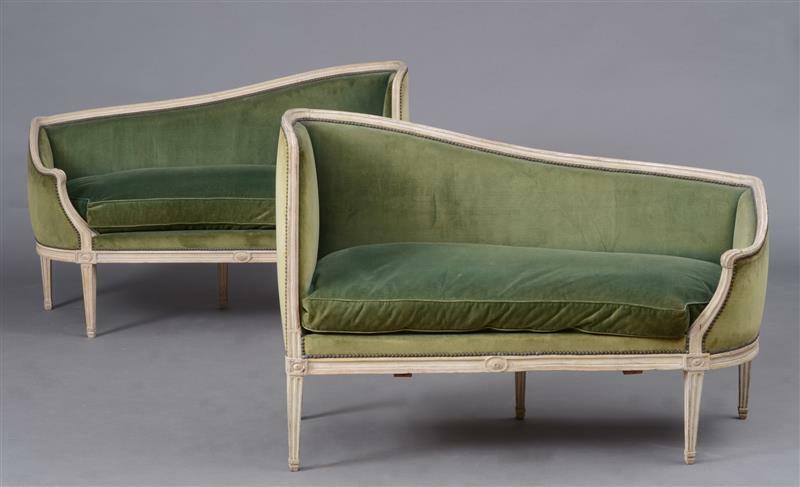 These daybeds are like magical boats that will whisk you away to some far off dream place. This is from Domino. This room is more about decoration than practicality, but fun to look at! Love the bright yellow walls too. This Italian Neoclassical walnut window bench has a fabulous shape. The winged arms make it magical. This is Lot 502 in the Stair auction, and has an auction estimate of $800 - $1,200. It would add instant character to a living room, entryway, or wherever it fits! The shape of the backs of these French petite canapes are what makes them special. I would think about reupholstering them in a black or a black and white stripe for a real statement. These are Lot 492, and each is 52 inches wide. 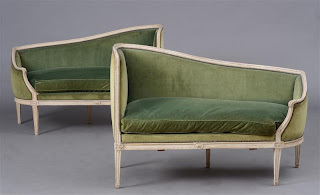 They are from the collection of Jeanne Van Waveren, and have an auction estimate of $2,000 - $3,000. For a statement decorative chair, the winged arms of this Italian Neoclassical chair would do the trick. It might be sacrilege, but I would also reupholster this is a dark color to make the wings pop. This is Lot 503, and has an auction estimate of $1,200 - $1,800. Finally, for something rustic and barely practical, I love garden furniture like this. It's worn and just looks great. 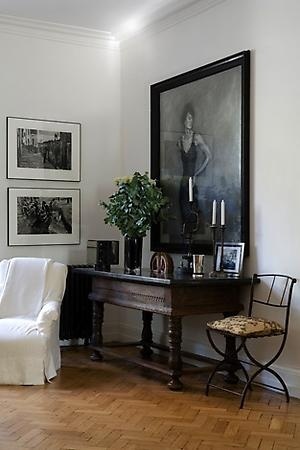 This would be fun in an entryway or just sitting against the wall like the one in Rose Uniacke's London home. I wouldn't put a cushion on it though - it would lose some of its charm! 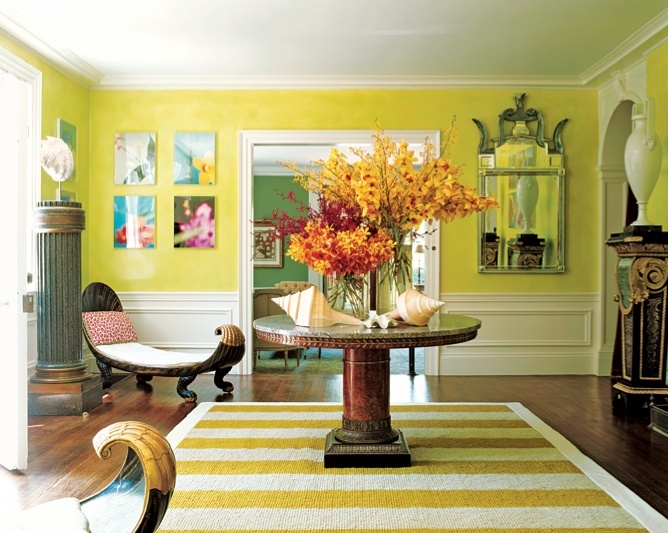 Every room could use a piece of furniture that's more conversation piece than practical. It's just another form of decoration. Keeping this in mind, you can really have fun looking through auction for unusual and fun pieces.